Hayden Mullins has not ruled out a permanent move to Notts County, even if they are relegated to League Two. 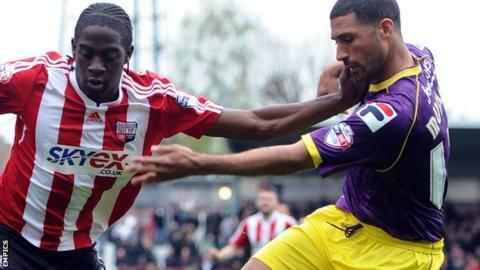 The 35-year-old utility player is on-loan at League One's 23rd-placed club from Birmingham for the rest of the term and out of contract this summer. "I know the manager, so regardless of what league the club was in, I'm sure we could get something sorted out," Mullins told BBC Radio Nottingham. "But at the moment, the focus is on trying to keep the club in League One." Mullins, who has also played for West Ham and Portsmouth, as well as Reading on loan, played with Notts manager Shaun Derry at Crystal Palace. The vastly-experienced former England Under-21 international has clocked up well over 600 senior appearances in all competitions. Notts County are three points adrift of safety going into Saturday's home game against Port Vale with five matches of the season to go.